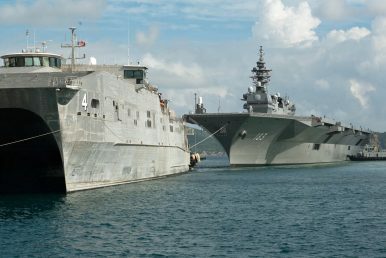 Earlier this month, Japan and Vietnam held the sixth iteration of a defense policy dialogue between the two countries. Though the expected engagement was just one of a series of engagements between them this year, it nonetheless put the focus on ongoing cooperation between the Asian states in the context of wider regional trends. As I have noted previously in these pages, over the past few years, Japan and Vietnam have been boosting their defense ties as part of their broader extensive strategic partnership. As they have done so, there have been some notable developments, including not just ones that make the headlines such as maritime security assistance, but new naval drills, Japanese port calls, an agreement on coast guard cooperation, and discussions on more defense equipment and defense industrial collaboration. Those developments have continued into 2018 as well, as both sides commemorate the 45th anniversary of the establishment of their diplomatic relationship. There have been a series of high-level visits that have put ties in the headlines, including Defense Minister Ngo Xuan Lich’s visit to Japan in April and Vietnamese President Tran Dai Quang’s state visit in May. And there have also been some notable advances, including the signing of a new Joint Vision Statement inked by the two defense ministers for that realm of the relationship out to the next decade (See: “Japan-Vietnam Defense Relations and the Indo-Pacific“). On July 4, the relationship was in focus again with the holding of the sixth iteration of the Defense Policy Dialogue by the two sides, which was co-chaired by Deputy Defense Minister Ro Manabe and his Vietnamese counterpart Nguyen Chi Vinh, who was on a broader visit to Japan. As is often the case with these engagements, the two sides discussed broader regional issues as well as ways to improve their bilateral defense ties as well. According to Vietnam’s defense ministry, both sides agreed that defense relations could be further strengthened, including in areas such as exchanges, consultations between individual services, and collaboration in areas such as military medicine, cybersecurity, defense industry, maritime security, and search and rescue. Apart from the dialogue itself, Vinh also met with a range of Japanese officials during his working visit to Japan, including Deputy Foreign Minister Kazuyuki Nakane, Deputy Secretary General of Japan’s National Security Secretariat Nobukatsu Kanehara, and Vice President of the Japan International Cooperation Agency (JICA) Ejima Shinya. What Did the Vietnam Premier’s Japan Voyage Accomplish?Japan-Vietnam Military Relations in Focus with Air Force Chief VisitNavy Drills Put Singapore-Japan Military Ties in the SpotlightJapan’s New ASEAN Defense Initiative in the Spotlight with First Disaster Relief EngagementWhat’s Next for Japan-Brunei Relations in 2018?